From the Florey Institute of Neuroscience and Mental Health (S.M.Z., S.A.M., S.M., E.V.G., A.M.P., G.D.J., I.E.S., C.A.R., S. Petrou. ); Department of Medicine (RMH) University of Melbourne (S.M.Z., S. Petrovski, M.S.H., J.D., S. Petrou); Department of Medicine (Austin Health) (M.S.H., J.D., S.F.B., I.E.S. ), University of Melbourne, Heidelberg; Department of Neurology and Epileptology (H.L., Y.G.W. ), Hertie Institute for Clinical Brain Research, University of Tübingen; School of Biosciences (A.M.P. ), University of Melbourne, Parkville, Australia; APHP (S.A.), Hôpital Robert Debré, Service de Neurologie Pédiatrique; Univ Paris Diderot (S.A.), Sorbonne Paris Cité, INSERM UMR1141, Paris, France; and Department of Paediatrics (I.E.S. ), University of Melbourne, Royal Children's Hospital, Parkville, Australia. Objective To examine the genotype to phenotype connection in glucose transporter type 1 (GLUT1) deficiency and whether a simple functional assay can predict disease outcome from genetic sequence alone. Methods GLUT1 deficiency, due to mutations in SLC2A1, causes a wide range of epilepsies. One possible mechanism for this is variable impact of mutations on GLUT1 function. To test this, we measured glucose transport by GLUT1 variants identified in population controls and patients with mild to severe epilepsies. Controls were reference sequence from the NCBI and 4 population missense variants chosen from public reference control databases. Nine variants associated with epilepsies or movement disorders, with normal intellect in all individuals, formed the mild group. The severe group included 5 missense variants associated with classical GLUT1 encephalopathy. GLUT1 variants were expressed in Xenopus laevis oocytes, and glucose uptake was measured to determine kinetics (Vmax) and affinity (Km). 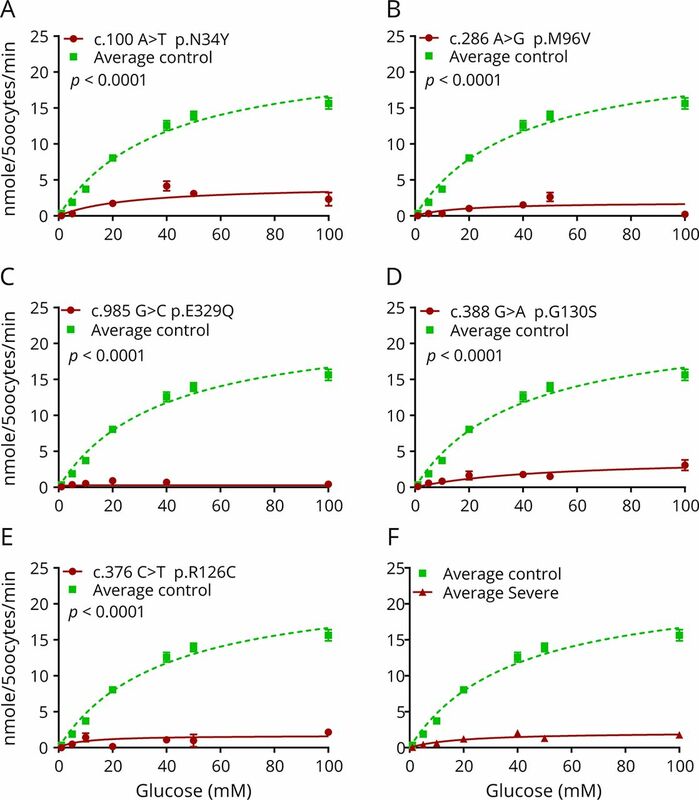 Results Disease severity inversely correlated with rate of glucose transport between control (Vmax = 28 ± 5), mild (Vmax = 16 ± 3), and severe (Vmax = 3 ± 1) groups, respectively. Affinities of glucose binding in control (Km = 55 ± 18) and mild (Km = 43 ± 10) groups were not significantly different, whereas affinity was indeterminate in the severe group because of low transport rates. Simplified analysis of glucose transport at high concentration (100 mM) was equally effective at separating the groups. Conclusions Disease severity can be partly explained by the extent of GLUT1 dysfunction. This simple Xenopus oocyte assay complements genetic and clinical assessments. In prenatal diagnosis, this simple oocyte glucose uptake assay could be useful because standard clinical assessments are not available. One possible mechanism for the wide range of phenotypic severity in GLUT1 deficiency syndrome is the extent to which mutations affect GLUT1 function. Deletions and null mutations of SLC2A1 are associated with severe encephalopathy, whereas missense mutations can be seen across the whole spectrum of severity.2,3,5,6,9,–,12 Deletions lead to complete haploinsufficiency, whereas the effects of missense changes are presumed to range from hypomorphic to complete loss of function. In this study, we examine that the range of residual function in missense variants causes GLUT1 deficiency. We compare the function of control missense SLC2A1 variants with patient variants associated with either mild disease or classical GLUT1 encephalopathy. We hypothesize that residual function of the missense alleles will be greater in those with mild disease compared with those with severe disease and that the difference will be sufficiently marked to be clinically useful in predictive testing. Three groups of variants were analyzed (table). 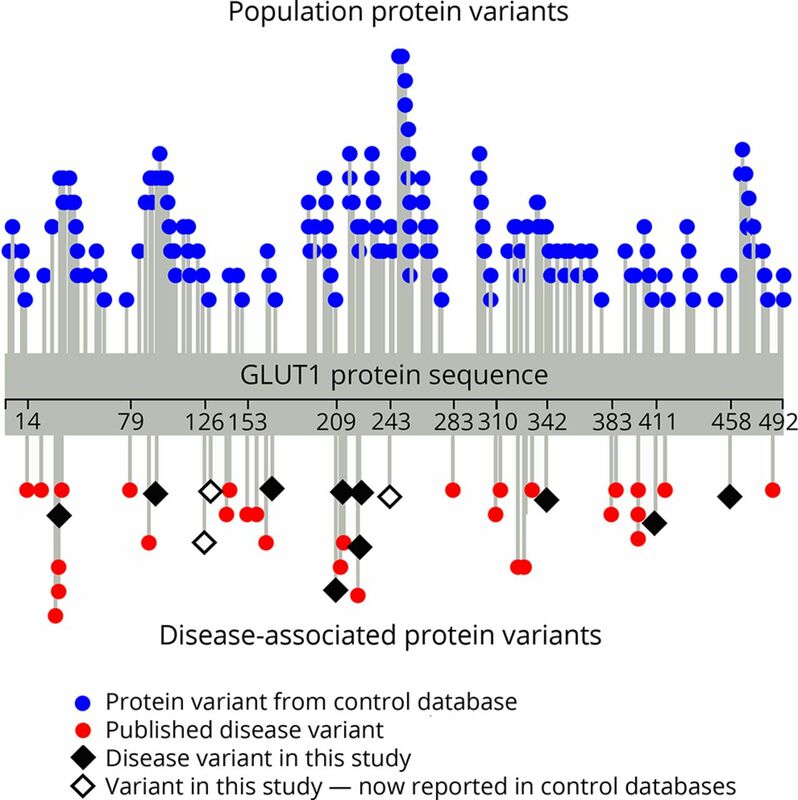 Variants were drawn from the published literature and unpublished cases clinically diagnosed at Austin Health.2,3,7,8,12,13 The control group comprised 4 population variants drawn from the ExAC database along with the reference sequence from the NCBI and was analyzed to determine the background variation of GLUT1 function in the general population. The “mild” group comprised 9 variants associated with mild phenotypes before functional assessments (table). Mild GLUT1 deficiency was defined as epilepsy or movement disorder with normal intellect in all individuals with the variant. Last, the “severe” group comprised 5 missense variants associated with severe GLUT1 encephalopathy before functional assessments. Variants in which a mixture of phenotypic severities had been reported, particularly intellectual disability in some cases, were excluded. GLUT1 deficiency leads to a number of neurologic disorders with a spectrum of effects, and no accepted rating scale for overall severity exists. By taking the opposite ends of this spectrum, mild disease with normal development and frank encephalopathy, we can be as confident as possible that the phenotypes are distinct and that functional differences in glucose transport should be present. Experiments were performed blinded to the phenotypic association (control, mild, and severe) of all genetic variants. The study was approved by the Austin Health Human Research Ethics Committee. All participants provided written, informed consent. Coding exons and splice sites of the SLC2A1 gene were PCR amplified using specific primers designed to the reference human gene transcript (Ref Seq NM_006516). Primer sequences are available on request. Amplification reactions were cycled using a standard protocol on a Veriti Thermal Cycler (Applied Biosystems, Carlsbad, CA). Bidirectional sequencing of all exons and flanking intronic regions including splice sites was completed with a BigDye v3.1 Terminator Cycle Sequencing Kit (Applied Biosystems), according to the manufacturer's instructions. Sequencing products were resolved using a 3730 × l DNA Analyzer (Applied Biosystems). All sequencing chromatograms were compared with published cDNA sequence; nucleotide changes were detected using CodonCode Aligner (CodonCode Corporation, Dedham, MA). The GLUT1 coding sequence (NM_006516.2 from NCBI) cloned into the pcDNA3.1 vector was purchased from GenScript and subcloned into the oocyte expression vector pGEMHEmcs, between BamH1 and HindIII sites. Point mutations were introduced using overlapping PCR (primers are listed in table e-1, links.lww.com/NXG/A129). Construct fidelity was verified by Sanger sequencing. The reference protein sequence used in this study was NP_006507. Plasmids were linearized using the Sph1 restriction enzyme, and cRNA was generated using Message Machine T7 transcription kit (Applied Biosciences, Ambion). The concentration and integrity of cRNA were determined using spectrophotometry and gel electrophoresis, respectively. Oocytes (Dumont stage V or VI) were surgically removed from Xenopus laevis and incubated in Barth solution (5 mM HEPES, 82.5 mM NaCl, 2.5 mM KCl, 1 mM MgCl2, and pH 7.4) with gentamicin (50 mg/mL; Sigma) and penicillin streptomycin (100 U/ml; Sigma) at 18°C. One hundred nanoliters of 60 ng/μL cRNA was injected into each X laevis oocyte using the Roboinject system (Multichannel Systems, Germany). Glucose uptake assays were conducted 72 hours postinjection. A X laevis oocyte glucose uptake assay was used to measure the transport kinetics and affinity of glucose binding to the expressed GLUT1 transporter. Experiments were conducted at 22°C in groups of 5 oocytes, and glucose uptake was measured using the radiolabelled nonphosphorylatable glucose analogue 3-O-(3H-Methyl)-d-glucose. Oocytes were washed in 1x ND96 (96 mM NaCl, 2 mM KCl, 1 mM MgCl2, 5 mM HEPES, and 2.5 mM Na Pyruvate) 3 times, allowed to rest for 15 minutes, then placed in 500 μL of 1x ND96 and 500 μL of uptake solution containing 200 mM NaCl, 2 mM MgCl2, 4 mM KCl, 4 mM CaCl2, 10 mM N-2-hydroxyethylpiperazine-N′-2-ethanesulfonic acid, pH 7.5, and with 3-O-Methyl-d-glucose (1, 5, 10, 20, 40, 50, and 100 mM) and 16 μL of radiolabelled 3-O-(3H-Methyl)-d-glucose (2 μCi; Perkin Elmer Biosciences). Oocytes were exposed to the uptake solution for 10 minutes. The solution was then rapidly aspirated and replaced with 1 mL of ice cold phosphate-buffered saline (150 mM NaCl, 10 mM sodium phosphate; pH 7.4) containing 0.1 mM phloretin (Sigma, Australia). Each group of 5 oocytes was solubilized in 250 μL of 2.5% sodium dodecyl sulphate overnight on a rocking platform. Ultima Gold scintillant (2.0 mL) (Perkin Elmer, USA) was added and counts were measured for 2 minutes in a liquid scintillation counter (TRI CARB 2900-TR, Perkin Elmer). Raw counts per minute were converted to nanomoles per minute (for a detailed account of the GLUT1 uptake assay, please see reference 14), and values were plotted against 3-O-Methyl-d-glucose concentration and data fit with the Michaelis-Menten equation using GraphPad Prism (Graph Pad software, La Jolla, CA). Calibration curves were constructed using known volumes of radioactive tracer in the uptake solution in the range of 3-O-Methyl-d-glucose concentrations. Water-injected oocytes were used to correct for nonspecific counts. Statistically significant differences between the Michaelis-Menten curves were determined using GraphPad Prism's built-in implementation of Global nonlinear regression to determine whether single or separate models are needed to fit the 2 data sets under comparison; an extra sum-of-squares F-test was used to make this comparison. One-way ANOVA was used to compare Km and Vmax values between the unaffected, mild, and severe groups, with two-tailed p values less than 0.05 considered statistically significant. The authors agree to share any unpublished data related to this article with properly qualified researchers in an anonymized fashion for the purposes of replicating procedures and results. SLC2A1 patient-ascertained variants, reported in the literature2,3,6,7,11,–,13 and newly discovered variants (p.A224G, p.L169P and p.A342T), were studied (table 1). A glucose uptake assay in X laevis oocytes was used to analyze the functional properties of 18 GLUT1 variants and the NCBI reference sequence (NM_006516). Of these 18 variants, 4 were population control ascertained; 9 were reported in individuals associated with mild phenotypes; and 5 with GLUT1 encephalopathy (table 1). The location of variants across the linear sequence of NP_006507 is shown in figure 1. This analysis shows a tendency toward hotspots where population variants are underrepresented. Although disease and benign variants cluster, these clusters overlap and are not sufficient for diagnostic purposes. The patient variants included in the current study span the distribution of the ClinVar and HGMD data sets. We used lollipops-v1.3.1 (github.com/pbnjay/lollipops/releases) to plot the distribution of gnomAD's 159 filter-passed missense variants (blue circles) based on the SLC2A1 canonical transcript (NM_006516.2; uniprot P11166). These represent normal variation in the gene. We also plotted the distribution of our 14 studied missense variants (black diamonds), with unfilled diamonds representing those studied in this article and that were reported in the ClinVar and HGMD screen, as described above. First, a search for “pathogenic,” “likely pathogenic,” or “likely pathogenic; Pathogenic” missense variants in ClinVar (accessed in December 2016) was performed, subsequently a search for “DM” classified variants was performed based on HGMD (hgmd2016.3). A review of the relevant entries and their associated literature found that 32 SLC2A1 case-ascertained missense variants (red circles) were accompanied with written commentary that the variants either arose de novo in the patient (n = 29 variants) or there was evidence of the variant segregating among all (and >3) affected carriers and without >1 unaffected carriers in the pedigree (n = 3 variants). The 4 control variants (p.V406I, p.Y44H, p.E299K, and p.F104L) produced similar levels of glucose uptake as the reference sequence glucose uptake curves for control variants are shown in figure e-1 (links.lww.com/NXG/A129). Values for the maximal uptake velocity Vmax and the KM constants are available in supplementary material (figure e-2). To better account for overall background variation, an average curve including the 4 control variants and the NCBI reference sequence was used as a reference for comparison in subsequent experiments. Comparisons of glucose uptake across the control, mild, and severe groups revealed a negative correlation between clinical phenotype severity and glucose uptake levels. A small reduction was observed in 8 of the 9 alleles associated with mild epilepsy (figure 2, A–H). Interestingly, one of the variants from the mild epilepsy group (p.E209D, figure 2, I) showed the opposite effect, with an increase in glucose flux, suggesting that the mutation is not pathogenic. All 5 alleles associated with classical GLUT1-DS: p.N34Y, p.M96V, p.E329Q, p.G130S, and p.R126C showed a marked decrease in function (figure 3, A–E). Uptake velocities for all mild and all severe variants were averaged across each concentration to highlight the difference compared with the average control curve (figures 2J and 3F). Variants in the mild cohort (orange) compared with the average reference curve (green). Curves (A–I) demonstrate a broad range of residual GLUT1 protein function, with (A–H) probands indicating a significant decrease in glucose uptake (p < 0.0001) when compared with the unaffected curve. Variant I, although presented with a mild phenotype, showed elevated glucose transport (p <0.0001). (J) Highlights the separation between the average of all mild variants (excluding the gain-of-function variant, I) at each concentration compared with the average unaffected curve. (A–E) (red curves) variants associated with severe GLUT1 encephalopathy phenotype demonstrated a significantly marked reduction of glucose uptake compared with average protein function (p <0.0001) (green curves). (F) Highlights the marked separation of the average severe variants compared with the average unaffected curve. A subsequent check of our 14 patient-ascertained variants within an international reference cohort (gnomAD database)15 identified p.A342T and p.M96V each among 3 individuals. This reference cohort did not specifically ascertain for individuals with seizure or severe pediatric disorders. The p.A342T variant, from the mild group, was found among 3 of 56,004 individuals of non-Finnish European ancestry (MAF of 0.003%) and not among other genetic ancestry groups. The p.M96V variant, from the severe cohort, was found among 3 of 6,655 individuals of Finnish ancestry (MAF of 0.02%) and not observed among other genetic ancestry groups. Being a bottlenecked population, risk alleles can reach higher frequencies among Finnish people than would be seen in outbred populations. However, given the overall observation of high penetrance (albeit variable expressivity) among GLUT1-associated disease, the genetic evidence for causality of these 2 variants becomes less certain with additional cases required to better understand their overall role in GLUT1 disease. To explore the diagnostic utility of a functional glucose uptake test for GLUT1 disorders, group-wise analysis of Vmax was undertaken (figure 4). Visual inspection of the box and whisker plot of Vmax showed a complete separation of ranges with only a minor overlap of the upper quartile of the mild group with the lower quartile of the control group (figure 4A). Because Vmax values were closely aligned with the uptake velocity at 100 mM glucose, the distributions of velocities at this single concentration were plotted (figure 4B). As with Vmax distributions, visual inspection revealed a complete separation, demonstrating that a single concentration point assay can, in most cases, discriminate the clinical groups as effectively as the full concentration range (figure 4B). In contrast, Km values were highly variable and we found that they had no discriminatory value (supplementary material, links.lww.com/NXG/A129). (A) Box and whisker plot for Vmax values obtained from the Michaelis-Menten curves for the unaffected (n = 5), mild (n = 9), and severe (n = 5) variants (single value scatter plots shown in figure e-1, links.lww.com/NXG/A129). (B) Box and whisker plot for the velocity at 100 mM glucose concentration for each group of variants. The variant resulting in NP_006507.2 p.E209D has been positioned as an outlier and not included in the population analysis. GLUT1 deficiency is viewed as a dosage sensitivity disorder, where reduction (hypomorphism) or complete loss (haploinsufficiency) of 1 allele leaves insufficient residual glucose transport.1 This study distils this concept further. The range of missense variants chosen for this study represents the extremes of the GLUT1 deficiency syndrome disease spectrum. The spectrum of illness associated with GLUT1 deficiency is extremely broad, ranging from disabled individuals with classical encephalopathy needing lifelong care to high-functioning individuals with mild, well-controlled epilepsy and movement disorder. In this study, we compare variants reported to always cause severe disease with those reported to always cause mild disease and demonstrate that there is indeed a difference in the residual function of the mutant protein that predicts that phenotypic difference. Based on this sampling of variants, we show clear separation in the distributions of Vmax of variants in each group, providing a basis for a diagnostic test. The potential diagnostic value of our approach is highlighted by the analysis of the p.E209D variant. Our GLUT1 uptake analysis revealed that p.E209D is unlikely to be pathogenic despite its absence in population variant databases of normal variation and affecting a highly conserved amino acid. We suggest that a combination of genetic evaluation and functional testing is required for improved diagnosis in GLUT1 deficiency. Variable expressivity can be seen in GLUT1 disease, suggesting the contribution of additional factors. This is frequently observed in familial GLUT1 deficiency where a spectrum of clinical presentations from unaffected carriers through to mild epilepsy or dyskinesia with normal intellect to refractory epilepsy and intellectual disability are seen.3,11,12 Variants from such families were excluded from this analysis because it was not possible to assign them to a particular severity group. These families highlight the need for future studies determining other genetic and environmental influences on disease severity in GLUT1 deficiency. We show that a simplification of the Xenopus oocyte assay can provide diagnostic value that is equivalent to complete determination of Vmax and Km. Our data show that a single concentration of glucose approaching saturation (100 mM/L) is sufficient to distinguish between control, mild, and severe cases. The addition of this simple functional test to clinical and genetic findings has the potential to improve the classification of patient-ascertained variants, as well as allow rapid intervention when the functional data suggest risk of serious disease. The diagnosis of GLUT1 deficiency syndrome was initially based on the combination of seizure phenotype and hypoglycorrhachia.1 After the discovery of SLC2A1 mutations, molecular testing has become routine.1,2 In addition to sequencing, a well-validated clinical test of GLUT1 function is currently available—the red cell glucose uptake assay.12 This assay is, however, not available in many centers and requires fresh, metabolically functional red cells, which can be difficult to transport over distance. The Xenopus oocyte assay used here requires sequencing data but no other tissue, removing the difficulty of transport. Prenatal exome screening looking for de novo mutations in known disease genes is available and likely to become increasingly common.13 The assay used here is possible within the time frames needed to enable a genetic counselor to discuss findings with families after fetal genetic screening. 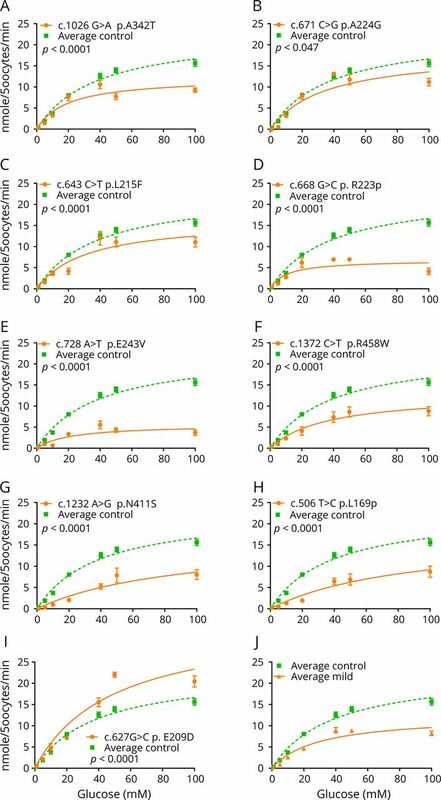 Overall, a simplified Xenopus oocyte assay offers a complementary, sequence-based test for GLUT1 variants of unknown significance. The assay helps discriminate background from causal alleles and can further give information on anticipated severity of disease. We believe that this is an important step toward multidomain data and advanced pattern recognition analysis such as machine learning that could be used to integrate data from clinical, genetic, molecular, structural, and functional assays to make faster and more informed diagnosis. Conception and design: S.M. Zaman, S.A. Mullen, S. Maljevic, E.V. Gazina, A.M. Phillips, M.S. Hildebrand, S.F. Berkovic, I.E. Scheffer, C.A. Reid, and S. Petrou. Acquisition and analysis: S.M. Zaman, S.A. Mullen, S. Petrovski, S. Maljevic, E.V. Gazina, A.M. Phillips, G.D. Jones, M.S. Hildebrand, J. Damiano, S. Auvin, H. Lerche, Y.G. Weber, S.F. Berkovic, I.E. Scheffer, C.A. Reid, and S. Petrou. Drafting of the manuscript: S.M. Zaman, S.A. Mullen, S. Petrovski, G.D. Jones, C.A. Reid, and S. Petrou. This work was supported by the National Health and Medical Research Council (NHMRC) Program Grant (10915693) to S.P., I.ES., S.F.B., and C.A.R., Research Fellowship to S.P., a Postdoctoral Training Fellowship to S.A.M., and an Australian Postgraduate Award to S.M.Z.. C.A.R is supported by a Dowd Fellowship. The Florey Institute of Neuroscience and Mental Health is supported by Victorian State Government infrastructure funds. Sasha Zaman has received travel funding in the form of the Caitlin Fund Scholarship; has received governmental research support from the Australian Postgraduate Award Scholarship; and has received academic entity research support from the Florey Institute of Neuroscience and Mental Health. Saul A Mullen has received speaker honoraria from UCB Pharma; has been employed with the Florey Institute of Neuroscience and Mental Health, Australia Austin Health, and Eastern Health; and has received governmental research support in the form of the NHMRC Early Career Fellowship and the NHMRC Project Grant. Slavé Petrovski serves on the advisory board of Pairnomix; has served on the editorial board of Epilepsia; and has been employed by AstraZeneca. Snezana Maljevic reports no disclosures. Elena Gazina has received governmental research support from the National Health and Medical Research Council. A. Marie Phillips has received governmental research support from the Australian Government. Gabriel Davis Jones reports no disclosures. Michael Hildebrand has received governmental research support from the National Health and Medical Research Council and the National Health and Medical Research Council. John Damiano reports no disclosures. Stéphane Auvin has served on the scientific advisory boards of Nutricia and Ultragenyx; has received travel funding or speaker honoraria from Nutricia; and serves on the editorial boards of Epilepsia and European Journal of Paediatric Neurology. Holger Lerche has served on the scientific advisory boards of Eisai, UCB, Bial, Telethon, and BioMarin; has received honoraria for speaking on educational activities from Desitin, Esai, UCB, and Bial; serves on the editorial board of Epilepsia; has received governmental research support from EpiPGX, the Federal Ministry of Education and Research (BMBF), and the German Research Foundation (Deutsche Forschungsgemeinschaft); and has received foundation/society research support from the Hertie Foundation. Yvonne Weber has served on the scientific advisory boards of nonprofit entities UCB, Desitin, and Eisai Pharma; and has received honoraria from UCB Pharma and for workshop participation from Eisai and Desitin. Samuel Berkovic has served on the scientific advisory boards of UCB Pharma and Eisai; has served on the editorial boards of Brain, Epileptic Disorders, and Lancet Neurology; is one of the inventors listed on a patent held by Bionomics Inc. (WO2006/133508) and is one of the inventors on pending patent WO61/010176; has received commercial research support from UCB, SciGen, and Eisai; and has received governmental research support from the National Health and Medical Research Council of Australia and NINDS. Ingrid E. Scheffer has served on the scientific advisory boards of Nutricia, UCB, and BioMarin; has received travel funding or speaker honoraria from Zogenix, GSK, Eisai, BioMarin, Athena Diagnostics, and the National Research Foundation in Singapore; has served on the editorial boards of Neurology, Epilepsy Currents, Epileptic Disorders, the Progress in Epileptic Disorders series, and Virtual Neuro Centre; has received patent revenue for diagnostic and therapeutic methods for EFMR and a diagnostic method for epilepsy; holds issued patents for methods of treatment and diagnosis of epilepsy by detecting mutations in the SCN1A gene, a diagnostic method for epilepsy (also published as Methods for the Diagnosis and Treatment of Epilepsy), Mutations in Ion Channels, and Diagnostic and Treatment Methods Relating to Autosomal Dominant Nocturnal Frontal Lobe Epilepsy; holds pending patents for a gene and mutations thereof associated with seizure and movement disorders, and diagnostic and therapeutic methods for EFMR; has served as a consultant to Ovid Therapeutics and UCB; participated in the Epilepsy Drug Consortium as investigator for GW Pharmaceuticals; has received governmental research support from the National Health and Medical Research Foundation (Australia), the Centre for Research Excellence Grant, the Targeted Call for Research into Preparing Australia for the Genomics Revolution in Health Care 2016-2020, the National Institute of Health's Centres Without Walls, the Medical Research Future Fund, and the Health Research Council (New Zealand); has received academic research support from the University of Melbourne School of Health Sciences; has received Foundation/Society research support from the March Of Dimes Foundation, the Queensland Emergency Medicine Research Foundation, and the Rebecca L Cooper Medical Research Foundation; has received royalty payments for technology/inventions for Diagnostic and Therapeutic Methods for EFMR (Epilepsy and Mental Retardation Limited to Females). Christopher Reid has served on the editorial board of Journal of Neurochemical Research; and has received governmental research support from the National Health and Medical Research Council. Steven Petrou has served on scientific advisory boards of Pairnomix Inc., RogCon, and Praxis Precision Medicines; serves on the editorial boards of PLOS Genetics and Neurobiology of Disease; has served as a consultant for RogCon and Praxis; has received ARC, NHMRC, and ARC Centre of Excellence for Integrative Brain Function (CIBF); has received academic research support from the University of Melbourne; has received Foundation/Society research support from the DHB Foundation and the SCN2A Research Foundation; and holds stock/stock options from Pairnomix, Praxis Precision Medicine, and RogCon. Full disclosure form information provided by the authors is available with the full text of this article at Neurology.org/NG. The authors thank all the patients and their families for participating in our research program. ↵* These authors contributed equally. The Article Processing Charge was funded by National Health and Medical Research Council (NHMRC). Accepted in final form August 9, 2018.
. Defective glucose transport across the blood-brain barrier as a cause of persistent hypoglycorrhachia, seizures, and developmental delay. N Engl J Med 1991;325:703–709.
. Glucose transporter-1 deficiency syndrome: the expanding clinical and genetic spectrum of a treatable disorder. Brain 2010;133:655–670.
. Absence epilepsies with widely variable onset are a key feature of familial GLUT1 deficiency. Neurology 2010;75:432–440.
. Early-onset absence epilepsy caused by mutations in the glucose transporter GLUT1. Ann Neurol 2009;66:415–419.
. Glucose transporter 1 deficiency as a treatable cause of myoclonic astatic epilepsy. Arch Neurol 2011;68:1152–1155.
. Glucose transporter 1 deficiency in the idiopathic generalized epilepsies. Ann Neurol 2012;72:807–815.
. Focal epilepsy in Glucose transporter type 1 (Glut1) defects: case reports and a review of literature. J Neurol 2014;261:1881–1886.
. Early onset absence epilepsy: 1 in 10 cases is caused by GLUT1 deficiency. Epilepsia 2012;53:e204–e207.
. GLUT1 gene mutations cause sporadic paroxysmal exercise-induced dyskinesias. Mov Disord 2009;24:S106.
. GLUT1 mutations are a cause of paroxysmal exertion-induced dyskinesias and induce hemolytic anemia by a cation leak. J Clin Invest 2008;118:2157–2168.
. Paroxysmal exercise-induced dyskinesia and epilepsy is due to mutations in SLC2A1, encoding the glucose transporter GLUT1. Brain 2008;131:1831–1844.
. Glut1 deficiency syndrome and erythrocyte glucose uptake assay. Ann Neurol 2011;70:996–1005.
. Genome-wide sequencing for prenatal detection of fetal single-gene disorders. Cold Spring Harb Perspect Med 2015;5:a023077.
. Expression of human glucose transporters in Xenopus oocytes: kinetic characterization and substrate specificities of the erythrocyte, liver, and brain isoforms. Biochemistry 1991;30:5139–5145.
. Analysis of protein-coding genetic variation in 60,706 humans. Nature 2016;536:285–291.